Don’t fear the dark – EMBRACE IT! 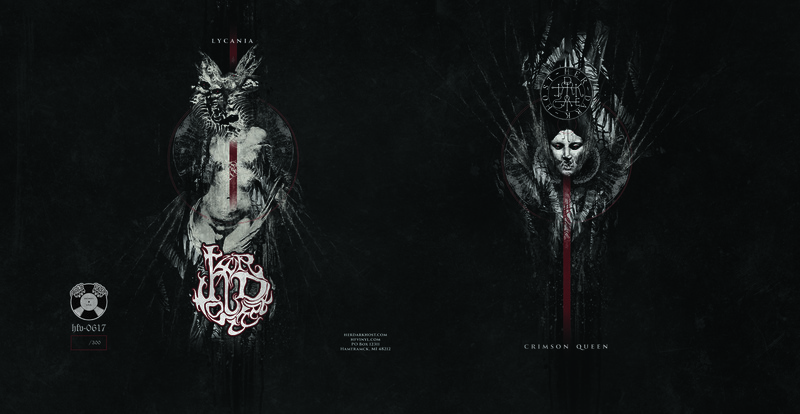 – Hold Fast is honored to present Her Dark Host’s “Crimson Queen” b/w “Lycania”. Metal is tricky thing. Since the creation of the genre, sonic heroes have guided us through the dirtier, darker, angrier aspects of humanity and their names loom large – Black Sabbath, Pentagram, and Danzig, just to name a few. While these towering greats have lit the lantern and held it high, the pretenders to the throne have claimed the crown by casting their lot in with the bedeviled spirits only to come up short, and foolishly so. Meanwhile, Her Dark Host brings not only a primal, urgent sound, but one that is howling and crawling up from the charred corners of humanity’s most haunted town, Detroit. When talking about this Detroit five piece, one cannot underestimate how a town that has embraced the darker side of the arts has birthed something so beautifully complex. Never forgot, “The Motor City” is the gritty womb that birthed such varied haunted artistic statements as vast as Alice Cooper and horrorcore rap as well as the dark poetics of Eminem to Sam Raimi’s “Evil Dead” films meet up with the world’s greatest masquerade in Theatre Bizarre and the annual, and all too real, Devil’s Night fires. But, while many of the amazing acts, and incidents, noted above have their roots in “The Paris of the Midwest”, do not expect any Grand Guignol shenanigans from Her Dark Host. This band is about the ritual – building a connection, truly and deeply, to other realms and taking audiences somewhere they have never been before, a true sonic black benediction – a literal black sabbath each and every show, each and every release. Justin, the coven’s vocalist & leader, takes his faith seriously. With a brooding, demonic gaze upon the crowd – a cold, unsettling atmosphere is conjured for all who come to bathe in the sonics and incense. Hold Fast is proud to present the invitation, and invocation, Her Dark Host offers you to simple their sonic delights and devilish debauchery on their first vinyl release – “Crimson Queen” b/w “Lycania”. This beautifully crafted, limited edition 7 inch on black vinyl is sure to be cherished by lovers of dark delights for decades to come due in part to the beautiful cover and gatefold piece by the dark, brilliant artist Legerdemain. An additional insert will also be included. Prepare for this visit to commune with the blackened spirits of Her Dark Host in this exceptional, premiere release. “Crimson Queen” b/w “Lycannia” is available in a special hand-numbered release of only 300 pieces in this first pressing. New sounds from Detroit’s Her Dark Host. Featuring a beautiful cover and inside gatefold designed by artist Legerdemain. Special logo art insert inked with the blood of singer/guitarist Justin Felix silk screened by Hype Ignition Screen Printing.